Official data from the Office for National Statistics shows that in quarter 1 of 2015, 91.3% of Bristol adults (328,000 adults over 16) stated they had “Used the internet in the last 3 months”. 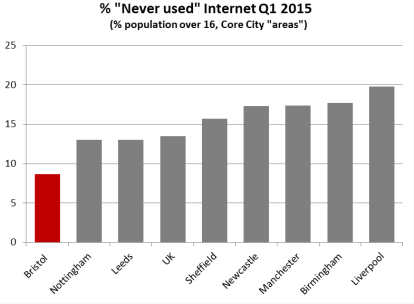 The percentage of people who have “ever used” the internet has been rising faster in Bristol than nationally, and conversely Bristol has the lowest % of people who have “never used” the internet out of all the English core cities. For comparison, this is a rise of 20,000 adults in Bristol in the last 2 years (from 85%), and Bristol’s 91.3% of connected citizens is significantly higher than the England average of 86.2%. However, the ONS report that accompanies this does highlight that, nationally, “there are digital divides between the young and old, and even across gender”. Even with Bristol’s very high rates of internet usage there are still 31,000 adults who have not used the internet at all in the last 3 months (or longer), although this figure is reducing rapidly.